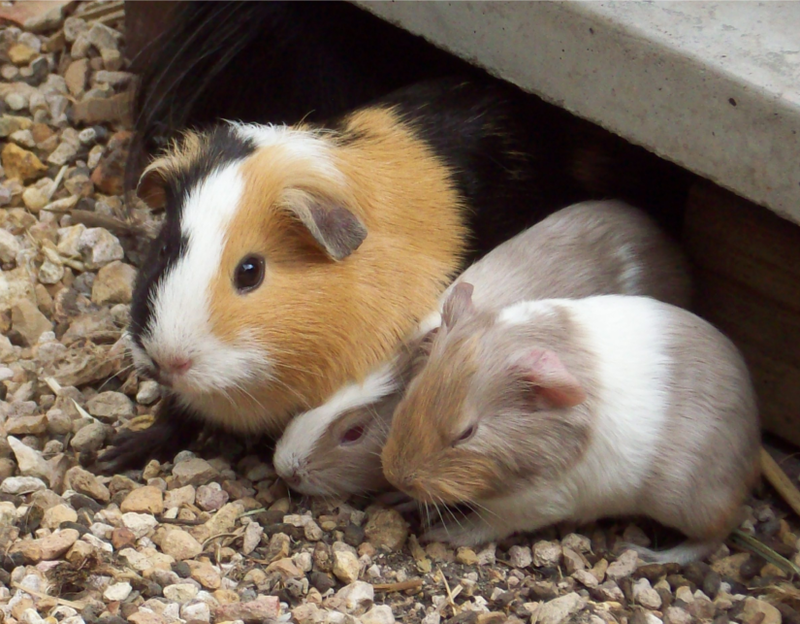 This is the second part of the Why Free Range Guinea Pigs? post. any kind of grass – bamboo leaves, sugar-cane leaves, grasses self-sown in the garden from ‘weed’ seed. cape gooseberry – young leaves, bark, berries both ripe and un-ripe. So there doesn’t really seem to be much that they won’t eat. At times I have had to barricade the GP’s out of particular areas of the garden. This didn’t occur as much of a problem initially because Maiki and Jazz kept to a very regular path of investigation and movement. It wasn’t until one particular winter when they were really craving a higher food input that I looked out to the garden from our kitchen window to see a strange bobbing of some of my broad bean plants. Immediately I had my suspicions and to my amazement there was Maiki and Jazz gorging on broad bean leaves in the further territories of the garden. Despite my disagreement and their quick retreat they soon returned to their new-found source of sustenance and when they had become bored with what leaves they could choose from they soon became very good at clear felling my broad beans to get access to the lovely new leaves higher up! After a few weeks I had this crop of grazed broad beans built into a raised garden bed and left a few strays on the outside of ‘the wall’ to the mercy of Maiki and Jazz. Over time they grazed on them and even worked as a team to hold bean stalks down with their weight while the other ate their share of the bounty from the newly accessible top leaves of the stalks. I am of the opinion now that GP’s are pretty switched on creatures. They are quite capable of managing their own affairs when given the resources and do so with very natural instinct. In cases of extreme heat the answer is actually simple for us as we are usually including melons in our own diet by that time of the year so all our melon scraps are taken to the garden for the GP’s to feast on and keep their hydration up. Carrots were also thrown to them occasionally and were happily dragged off into a secluded spot to be gnawed away. Basically any fruit scraps from our kitchen are taken to the garden for either the GP’s or the chooks. Usually by summer they also have cape gooseberry bushes that they like to keep cool under and feed on any berries within reach (they even began to climb part of the bush to raise up on their hind legs and reach higher berries) as well as tidy up any that fall to the ground. Gradually they acquired a taste for the leaves also and stripped much of the lower bush of leaves which also kept it rather tidy as well and stopped a build up of rotting berries while giving the bush a good source of manure. In times of extreme cooler temperatures, which for us in Albany is the lower Celsius single digits and rarely 0 or minus degrees, the GP’s wander under the house and find a cosy place to sleep. This has been on anything from scraps of carpet left for them to utilise to black plastic scrunched up so they can explore all the creases and folds and make a cosy spot. As long as they are given choices they will use what they require. Most of our GP’s are short-haired with Maiki being the exception. She had a medium coat with longer hair at the back end. I prefer the short-haired GP’s as they are easily managed and keep themselves groomed and from observations they can move quickly and I feel moderate their temperature better during the warmer weather. During colder nights they are quite capable of cuddling up for warmth together. 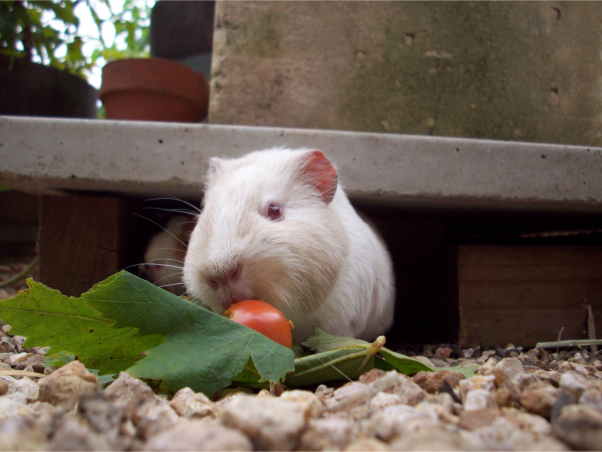 Advantages for keeping guinea pigs free-range in a back-yard. Improved health and fitness. See this more recent update. Given their ability to obtain food at the rate required they do not require a water source unless in extreme heat – see above for example of melons.